At Drennon, just below the railroad bridge that connects California to Arizona, Barry Stapp hands Sharlot off to a Chemehuevi guide named Moon who lives along the river on the California side. Moon is very tall, six foot three, and he wears an unblocked hat with two feathers stuck in the top of the crown. He speaks perfect English and he has a wicked sense of humor. Oh, and he gives Sharlot a very stubborn mule named Molly to ride. They do not get along, but Molly later saves Sharlot's life. End of pitch snippet. 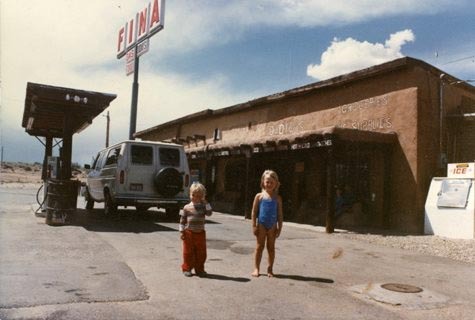 Meanwhile, here's a historic photo of my kids, Tommy and Deena on one of their first road trips back in 1984. This is at the turn to Billy the Kid's grave, about 25 miles north of Socorro, New Mexico.